Many people prefer to grow pole beans over bush beans due to the fact that pole beans will produce longer. But pole beans do require a little more effort than bush beans because they must be staked up. Learning how to stake pole beans is easy. Let’s look a a few techniques. One of the most common pole bean supports is, well, the pole. This straight stick is so often used when staking beans that it is has given its name to the bean it supports. The bean pole is used because it is one of the easiest ways how to stake up pole beans. 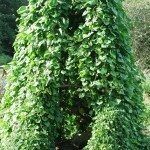 When using poles as pole bean supports, you’ll want the pole to be 6 to 8 feet tall. The pole should be rough to help the bean grow up the pole. 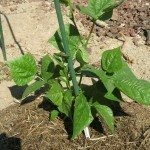 When planting pole beans to grow on a pole, plant them in hills and place the pole in the center of the planting. A bean plant teepee is another popular option for how to stake pole beans. A bean plant teepee is typically made of bamboo, but can be made of any thin long supports, like dowel rods or poles. To make a bean plant teepee, you will take three to four, 5- to 6-foot lengths of the chosen support and tie them together at one end. The untied ends are then spread out a few feet apart on the ground. The end result is pole bean supports that look very similar to the frame for a Native American teepee. 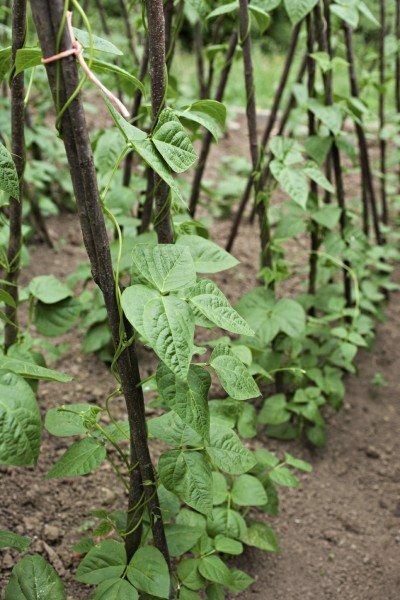 When planting beans on a bean plant teepee, plant one or two seeds at the base of each stick. A trellis is another popular way how to stake pole beans. A trellis is basically a moveable fence. You can buy these at the store or you can build your own by connecting slats in a criss-cross pattern. Another way to build a trellis for staking beans is to build a frame and cover it with chicken wire. The trellis need to be 5 to 6 feet high for staking beans. When using a trellis as pole bean supports, plant the pole beans at the base of your trellis about 3 inches apart. These store bought wire frames are frequently found in the home garden and are a quick, at-hand way how to stake up pole beans. While you can use tomato cages for staking beans, they make less than ideal pole bean supports. This is because they are not tall enough for the typical pole bean plant. If you use tomato cages as a way how to stake up pole beans, just realize that the bean plants will outgrow the cages and will flop over the top. They will still produce pods, but their production will be reduced.